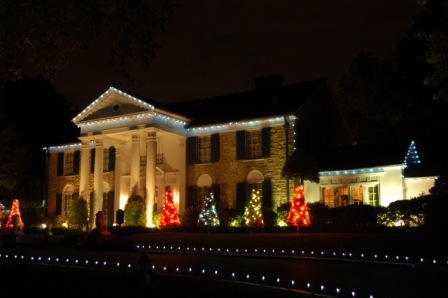 Graceland: The Living Legacy of Elvis Presley, first published in 1993, has stood the test of time as the outstanding book about Elvis’ Memphis mansion. It’s 250+ pages jam packed with sumptuous full gloss visuals and a near 70 page essay by noted rock critic, Chet Flippo, made it one of the best Elvis books of the 90's decade. In 2012, Joseph Pirzada’s Boxcar organisation has released Elvis Presley’s Graceland Through the Years 1957-1977 with a view to lifting the bar even higher. So does the Boxcar release surpass the 1993 book? EIN delves inside what is a veritable treasure trove of information and visual magnificence. We have come to expect high quality productions and presentation from Joseph Pirzada and he doesn't let us down with his latest offering! That the research, writing and production of Elvis Presley’s Graceland Through the Years 1957-1977 took more than four years, is well evidenced by the attention to detail and quality of the finished product. The book design is sublime and you are literally blown away by an incredible array of amazing visual images! The Pirzada book is a composite history lesson and visual treat. 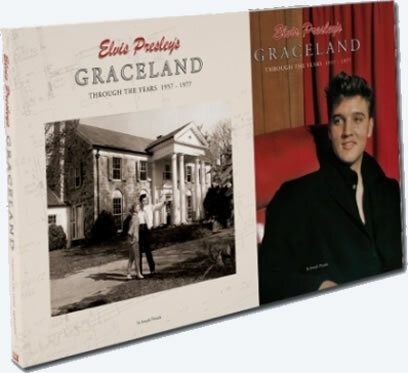 With a massive 450 pages (200 more than the 1993 book) and more than 1,000 photos, Elvis Presley’s Graceland Through The Years 1954-1977 offers much more than all other releases about Graceland. A range of archival miscellanea (press clippings, order dockets, et al) nicely supplements other aspects of the book. Regardless of the scarcity of the images, the overall production quality of the release is a major attraction and selling point. The book itself is large sized (255mm x 320mm) with 450 pages of high quality, semi-gloss paper stock. To protect the book it is housed in a very stylish and attractive, sturdy slipcase. The book cover featuring a rich red & black off-centre image is captivating. The page design is simple and excellent. One advantage that the 1993 release has over the 2012 book is that the visuals are presented on full gloss paper stock, giving them added luminance. In comparison, the Pirzada images are presented on semi-gloss paper stock and while still very striking, aren’t quite as bright looking (shiny) as a number of photos in the earlier book. 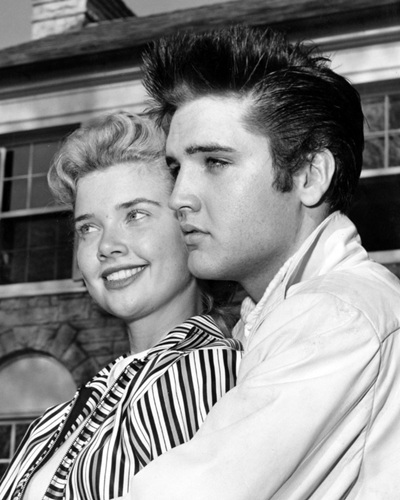 Elvis Presley’s Graceland Through the Years 1957-1977 is split neatly into two parts. Part 1 is a composite photo-journal of Graceland and Part 2 is a decade by decade Photographic Journey with a final chapter about Graceland post Elvis' death. 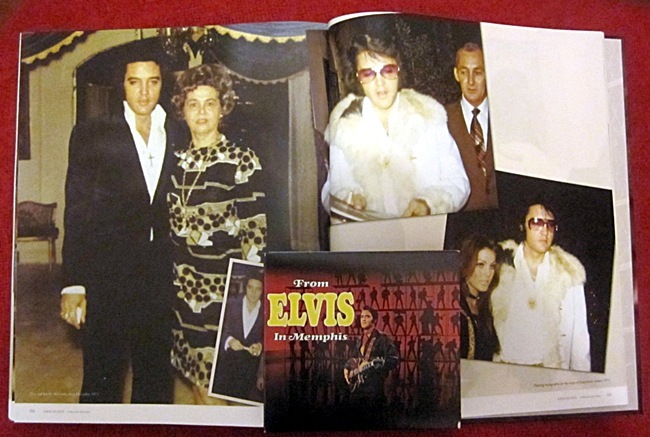 The second section, the Photographic Journey, features little text but is another 190 pages packed full of Elvis photographs and stunning candids! 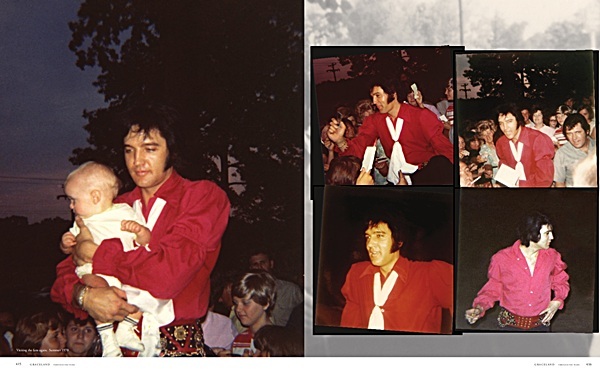 With over 1,000 images in Elvis Presley’s Graceland Through The Years covering virtually all conceivable aspects of the mansion and its inhabitants, collectors will want to know how many are previously unpublished. Not surprisingly, determining what has and hasn't been previously published is problematic, particularly in our highly wired internet world. For this reason, Joseph Pirzada is unable to give a definitive figure, however he told EIN he believes there could be around 100 images that have never been published before and many, many more that are very rare. 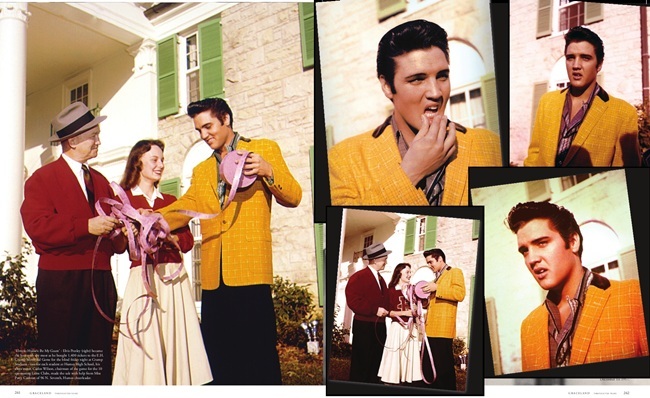 For instance, the double-page spread (above) of Elvis on Decmber 1st 1957 outside his new home features some known images as well as some previously unpublished photos - and all in wonderful quality. Overall, I found there is a good balance between the well known and the not so well known photographic images in the book. When you open Graceland Through The Years and move through each room in the mansion, both downstairs and upstairs, the ornate, sometimes garish and highly colourful nature of the décor at Graceland stimulates your senses! 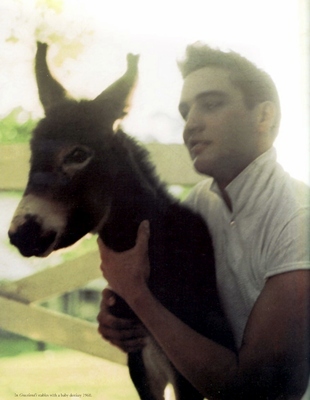 Those readers who have visited Graceland will know what I mean. With numerous full page photos and higher quality images for many previously published photos, the visual aspect of the book never fails to delight and amaze. 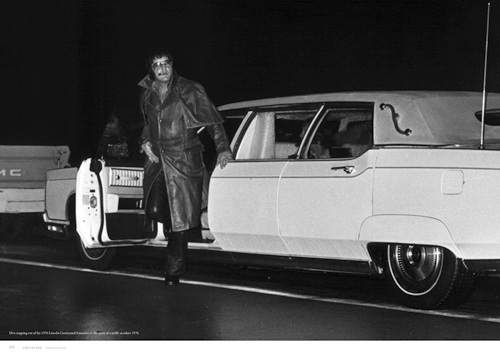 The 'Automobile Obsession' chapter alone is 38 pages, featuring around 70 photos including plenty of candid shots of Elvis with his cars and motorcycles that we haven't seen before - and certainly not in this quality. Throughout the book the photos are generally captioned when necessary. 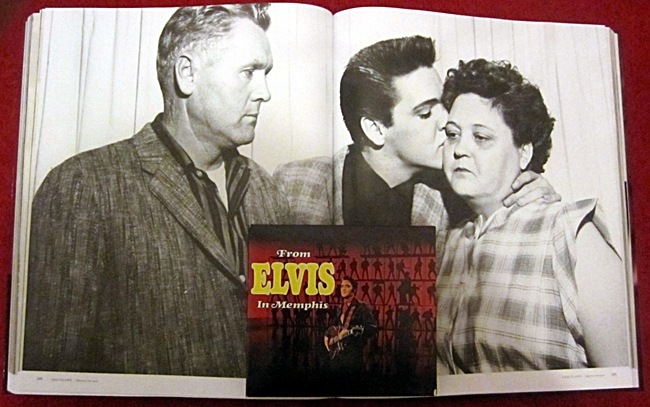 The narrative text provided by Rhonda Marsden, John Michael Heath and Joseph Pirzada is, as usual, well written, interesting and adds to our knowledge about Elvis. Some years later, on February 11 th 1957, a local Memphis realtor Virginia Grant had a chance meeting with Gladys Presley during a shopping expedition at Lowenstein’s – then a major department store in Memphis. However, Mrs Grant soon discovered she had underestimated the Presley’s budget range. After showing Vernon and Gladys the property she thought would be ideal for them, it turned out to be of a much lower financial value than they were prepared to pay. Luckily Gladys had confided her hopes of finding a colonial style home, and that set the wheels in motion again. There was a lovely white-columned home on Highway 51 that Mrs Grant knew of. In 1974 many areas of the house took on a new appearance when William Eubanks, a young interior designer who was working at Engels Interiors in Memphis, was hired to redecorate it. 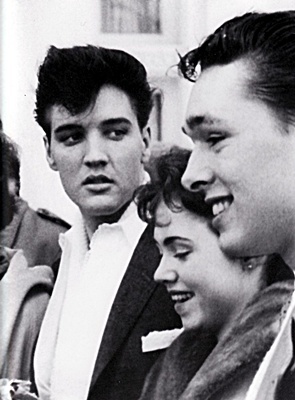 She [Linda Thompson] in turn showed Elvis the ideas and details they had come up with, though no work was started until he had given his final approval. The lighting in the room was provided by a tall floor lamp covered in seashells, while a matching framed mirror hung nearby. Hanging in his office was a framed copy of a famous speech by Theodore Roosevelt called The Man Who Counts, as well as a piece of writing entitled The Penalty of Leadership. 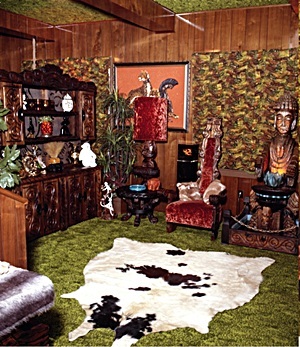 Naturally, Elvis needed a means of expressing himself musically in this area of the house too, so he had a wood-panelled organ installed, which complemented the padded light brown walls, and the darker brown patchwork draperies. 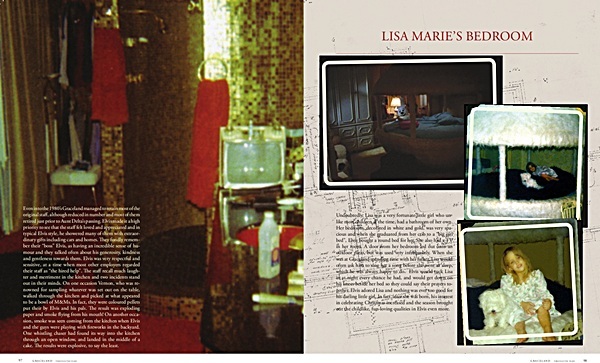 Later, in the 1970s, these draperies were changed to a brilliant red to match the theme throughout the house. On one wall of Elvis’ dressing room there were heavy-duty rods that had to be reinforced to support the weight of Elvis’ jumpsuits, and seven foot tall shoe racks holding all his shoes. The hefty price tag around $100 / 65 pounds / 80 Euro (not including postage) may put some fans off, but it shouldn’t. The Boxcar organisation has released a high quality book which, comparatively, provides very good value for money. While the Elvis book world as a whole is checkered, at the top end it has evolved into a consistently superior industry to its musical counterpart, and one which currently produces a steady stream of consistently high quality, fan pleasing releases. At the start of this review I said Graceland: The Living Legacy of Elvis Presley was one of the standout books of the 1990s decade. 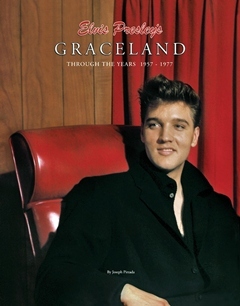 Elvis Presley’s Graceland Through the Years 1957-1977 takes the focus on Elvis' beloved Memphis home to a whole new level, and in so doing stamps itself as one of the standout Elvis books of the new millenium! Verdict: Joseph Pirzada has succeeded in producing the most narratively informative and visually comprehensive account of Graceland yet released. Elvis Presley’s Graceland Through the Years 1957-1977 towers above other similar releases (see list below) and the result is one of those rare releases which will bring you countless hours of viewing and reading pleasure. We recommend you be quick to purchase this release. It is a limited edition and stocks are unlikely to last long. Please note that our low-res scans EIN have used in this review do not do the real photographs justice! -Copyright EIN June 2012 - DO NOT COPY Images or text.